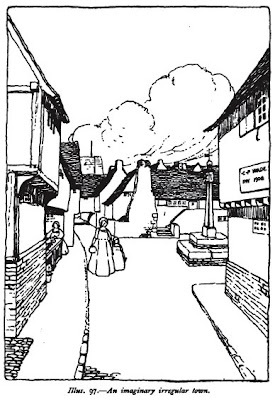 If Ebenzer Howard was the visionary and salesmen for the Garden City concept (his close friend George Bernard Shaw nicknamed him the "Garden City geyser" because he wouldn't stop talking about it), Raymond Unwin was given the task of making sure the design details fit with the overall social philosophy and aesthetic ambitions. Once Howard was able to round up enough finances to start implementing his idea, Unwin and his partner Barry Parker were commissioned to draw up the actual plans for Letchworth Garden City and Hampstead Garden Suburb. Neither Unwin nor Parker were trained architects or planners, but they learned their skills through observing traditional forms, learning from German contemporaries, and practicing on their own projects. In 1909, five years after the first Garden City of Letchworth was commissioned, Unwin collected all of the lessons he had learned into a treatise, Town Planning in Practice. Peter Hall has written: "Unwin and Parker raised the art of civic design to a level of pure genius, after which almost everything else was pedestrian anticlimax." Many of the principles in this book were considered obsolete for decades, only to be dusted off and brought back into the mainstream by the New Urbanists in the 1980's. The following post is not a summary, but some of my own reflections prompted by reading Town Planning in Practice. Once again, we have the privilege of free access to this work through Google. Email me, if you would like a pdf that I have formatted to be optimized for printing (I've condensed 489 pages down to a little over 200). By the time Unwin was building towns, a debate had long simmered in England between formal and informal gardens. The Formalists preferred neat, symmetrical geometries obviously invoking their human design, while the Informalists preferred the wild disorder of natural beauty. 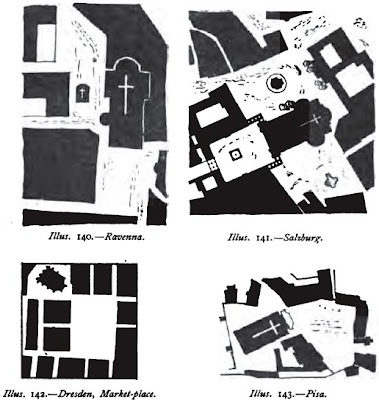 A similar dichotomy had existed between Medieval and Baroque styles of urban design. The Medieval city had evolved gradually through many individual decisions to adapt human habitation to the existing environment. Streets followed the natural curvature of a cow path, and buildings were comfortably layered onto their context. The Baroque style, on the other hand, was planned in advance according to a preconceived notion. Most famously, Haussmann had been hired by Napoleon to "modernize" Paris with broad tree-lined boulevards, uniform heights, and formal gardens. "The very rapidity of the growth of modern towns demands special treatment. The wholesale character of their extension almost precludes the possibility of our attaining that appearance of natural growth which we have admired in the medieval town, where additions were made so gradually that each house was adapted to its place, and assimilated into the whole before the next was added. We already see in the modern suburb too much evidence of what is likely to result from any haphazard system of development. Modern conditions require, undoubtedly, that the new districts of our towns should be built according to a definite plan"
This is as good and succinct a defense of planning as I've seen. The idea of the Medieval city has undergone somewhat of a resurgence in recent years through the concept of emergence, a recognition of systems' self-organizing potential, and some urbanists have concluded that great cities can still be built strictly through the mechanisms of the free market. A completely different group celebrates the informal evolution of the slums in global cities. I personally believe that Unwin's answer to these challenges still stands, maybe more so now than ever. Rational planning may not be the ideal, but it has emerged has a necessary countermeasure to the speed and economies-of-scale inherent to advanced capitalism. "It is not an easy matter to combine the charm of town and country; the attempt has often led rather to the destruction of the beauty of both." The human mind wants to make sense of it's location and categorize it accurately. While not getting very specific on how growth can be controlled to maintain a sense of containment, Unwin does advocate for a greenbelt around an existing town with provisions made for a certain degree of growth. Entrance corridors need to clearly convey a transition from one place to another and should be an important aesthetic focus of the plan. The sense of enclosure is also important to the individual places within a town. A central square, from the Greek agora to the medieval European church grounds, needs a "frame for the street picture." It should be enclosed on all sides by buildings of an appropriate height, and the area itself should be appropriately sized according to the proportions of this visual frame. Unwin takes issue with the notion that expansive views and open space are always more preferable for public spaces. Almost of of the great traditional cities have enclosed public spaces, with the Piazza San Marco being one of the most obvious examples. This also impacts decisions about street widths. Even by 1909, English local government regulations were calling for excessively wide streets universally. While Unwin agreed that busy arterials needed to accommodate the traffic, he lamented the fact that aesthetic proportions of regular streets were thrown off balance by these strict requirements. Streets ought to be arranged according to a hierarchy, and sometimes even the lowly footpath or alley is the most beautifully scaled to its context. Is There an Optimal Density? Technically, Unwin's answer is no. It depends on the site. But he does offer some principles for determining what a density for a particular urban area should conceivably be. This is a point where Unwin, and Howard before him, can be easily misinterpreted. He often speaks of lowering the density of existing cities, particularly of London, but these comments need to be read in their historic context. Early industrial European cities were intensely overcrowded, and this was before many of the modern amenities of sanitation, public infrastructure, and building techniques were fully utilized. Even the laws enacted to prevent overcrowding still allowed in excess of 40 to 50 Dwelling units per acre (DUA), and the average London unit in 1903 fit 7.6 people. It was universally agreed that this level of density, under these conditions, was unhealthy and positively inhumane. "The desirable number would be between 10 and 20 houses to the acre, and in this case I refer to the net measurement of the building land, excluding roads." "It's not easy yet to weigh the disadvantages that might arise from enlarging our towns to such an extant as would give a much lower number of houses to the acre." Unwin urged a designer or elected body to work with the unique identity, or even "personality", of the individual town or neighborhood. For this reason, he is reluctant to provide precise formulas or step-by-step instructions. He sees the homogenization of housing architecture, street layouts, and public spaces as detracting for the diversity of expression. I find it interesting that years before the International Style of Modernism, which sought to replace local variation with a single global aesthetic, rose to the heights of the architectural establishement and came crashing down again, Unwin was a firm advocate for local vernacular styles. "from this fact there resulted in a great harmony of colour and style in each village or town; and, secondly, a great variety of colour and style between the different towns and districts." The diversity of individual buildings ultimately leads to the homogenization of towns and regions. Instead, Unwin sees the modern town as a cacophany of individual buildings vieing for attention. "The business man at any rate believes that he must shout if he is to live, and naturally desires his architect to help him make his building do some of the shouting for him." From this, he sees an easy progression to the rise of starchitecture. What to do about this? He hopes that if planners and architects are properly trained, they will learn to recognize and draw out inherent local strengths. Otherwise, he plays with the notion of form-based codes, to require certain design criteria for a district, but he is careful to include the allowance of variances for special conditions. Landmarks are also a good way to put an individual stamp on a town. This is an excellent overview of one of the great, and too often overlooked, urban thinkers from the 20th century. Strategy and accuracy plays important roles in urban planning. An unplanned city might evoke much disgust besides practical problems like transportation hassles, water problems, congestion etc. The concept, town planning involves effective land use along with transportation planning to improve the look and feel and socio-economic environment of the city. could u please share Unwin's book with me aswell ? hello, could u please share Unwin's book with me? This is an old yet informative publishing about one of urban thinkers from the 20th century. The whole process of writing an article is the same as essay writing. Nice sharing! Keep it up!